Gouache is a paint I've been seeing more and more of lately and I didn't even know this type of paint existed until recent months. I usually use acrylic and watercolours but have always wanted to take elements from each one and have something in between. Having done a LOT of research around gouache before buying some, I discovered that this was in fact the happy medium between acrylics and watercolours and it's a huge favourite amongst illustrators in particular. Unlike acrylics and watercolours, when gouache dries you can in fact reactivate it with a little bit of water so you could come back to your artwork the next day and rework some of the colours. 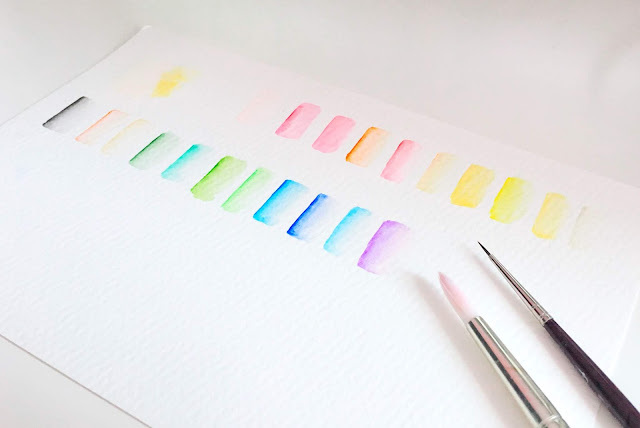 They can be layered, watered down, mixed to make new shades and they behave similarly to watercolours so a lot of people advise that watercolour paper is used for gouache. Unfortunately I only have hot pressed paper in my house right now which I don't get on with as well as cold pressed. The difference? Hot pressed tends to be smooth paper where as cold pressed is the lovely textured watercolour paper. But determined to not waste it, I set to work on a new illustration to test out my new set of gouache. I had actually put an order on Amazon for a set of Reeves gouache paints but later cancelled my order as I hadn't checked to see if the paints contained any animal ingredients. Being a vegan I'm trying to be a lot more mindful of what I am buying so I contacted the brand directly who told me they didn't know for sure if the ingredients were cruelty free and vegan friendly so I'm glad I did cancel my order. 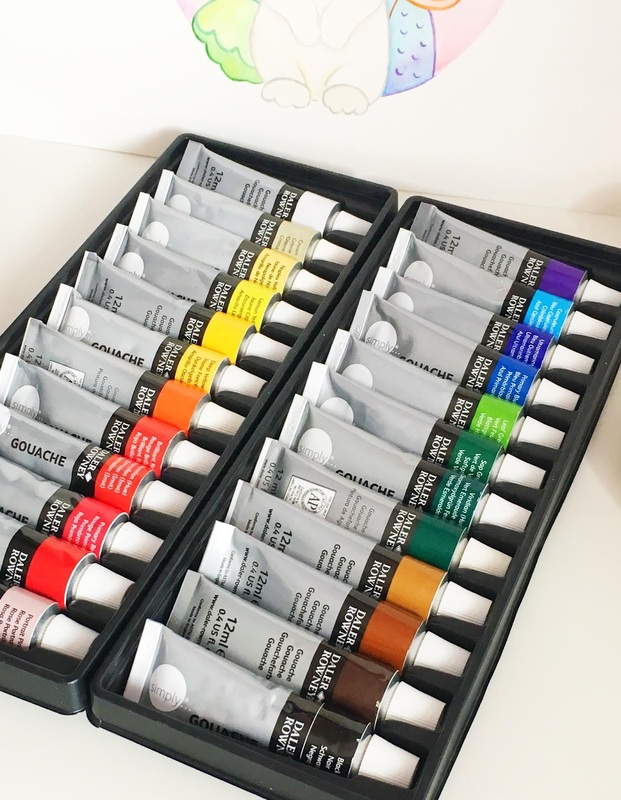 Then when I was in The Range last week, I spotted this kit by Daler Rowney and remember reading on The Vegan Womble that their designer range were vegan bar a couple of grey shades and a black. This set is the 'simply' range which is basically the value pack and the cheaper version (I assume) and I couldn't find anything online to say they weren't okay so I picked a box up. I will be contacting Daler Rowney to double check though as I think it would be useful to know. The kit cost me £10 for 24 different colours so straight off, this is excellent value for money especially if you're trying gouache for the first time. A lot of artists might say you can't really judge whether you're going to like a new medium based off a cheap set as they might not perform as well but I saw that as even more of a reason to review this value pack. Not everyone has £££'s to spend on gouache and they can be very expensive for other brands. Some of the tubes in this kit did have space inside them and weren't 100% full but even this hasn't put me off the price. You get an excellent selection of colours which mix together well and I really enjoyed playing about with their opacity. Overall, I can indeed see what the hype is about with this particular medium and I can't believe I hadn't tried it sooner. Even this cheap value pack of paints performs pretty well and I'm chuffed with the finished result! I actually scanned this piece in and sent it to my iPad to have a play about on the Procreate app, but the image above is the original illustration and I can't wait to start using this pack of gouache to produce some more. 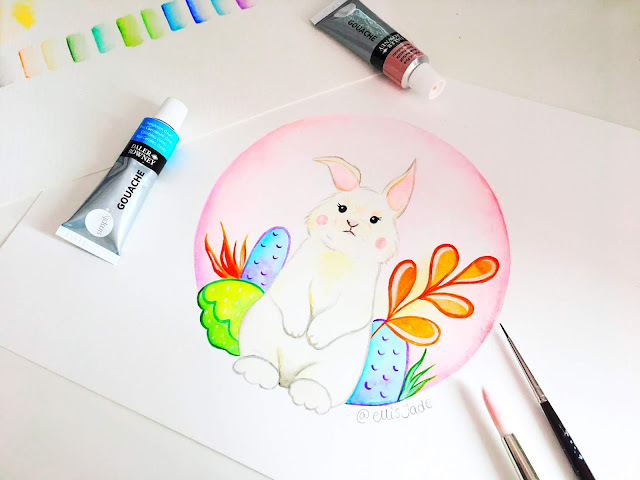 Have you ever tried gouache paints?